Part 1: Is it possible to recover deleted files from Nokia N97? Part 1.Is it possible to recover deleted files from Nokia N97? Accidentally deleted files from your Nokia N97? Please don't be in a major panic. It's totally posso recover deleted photo, video and audio from Nokia N97 phones. Why? When it comes to smart phones, there are usually memory cards inside, used to store your media files like music, pictures and videos. When you delete files, the place on the memory card used to stored those files is marked as blank and available for new files, and deleted files become invisible. If you didn't put new files in, you can easily recover those deleted files from the memory card on your Nokia N97. To retrieve deleted files from Nokia N97, you need to get a Nokia N79 recovery tool before doing anything else. Choosing a reliable program is very important, because some unreliable ones can damage your lost files and make them unrecoverable. If you don't have a good idea already, try Wondershare Data Recovery and Wondershare Data Recovery for Mac. Both of them fully support the recovery of photos, video and audio files from Nokia N97, no matter if they're lost due to deletion, format or otherwise inaccessibility. It only takes you a few minutes to retrieve all lost files in 3 steps. Try the free trial version of this Nokia N97 recovery software now. After downloading and installing the program on your computer, launch it now, and you'll get the interface as follow. Click the "Start" button to begin Nokia N97 file recovery. Meanwhile, make sure your Nokia N97 phone has been well connected to the computer. To recover deleted files from Nokia N97, you can select the option "All File Types" to start or you can select the specific types. Here your Nokia N97 appears as a drive letter. 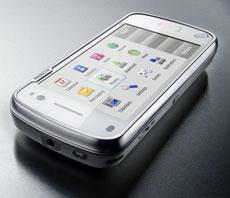 Select it and begin to search lost files of your Nokia N97 phone by clicking the "Start" button to scanning lost files. If quick scan can't find your files, go to deep scan which will deeply search your lost files. Last step now. You can preview all photos and check those files you want and click "Recover" to save them on your computer with one click. Note: Don't save the recovered data on your Nokia N97 or the memory card again. Find another place for it like on your computer or other external disk, for safety's sake.